The Power and Profitability of Trust was developed for educating Financial Advisors on how to better serve their clients. However the underlying principles are important to all aspects of the financial service sector. With the advent of the new Department of Labor Fiduciary rules, the relationship between Financial Advisors (FA) and their clients is changing. In the wake of these changes, “Trust” – what it is, how to achieve and maintain it – will become one of the most important topics in the financial service industry. Success – for both the individual and the organization - will depend on the ability to establish and maintain “trusted” relationships between FAs and their clients. The challenge: Despite the acknowledged importance of trust, the concepts about the nature of “trust are so vague and abstract, few people can define what trust is, no less evaluate or measure it – or have specific strategies to develop and maintain it. An easy-to-understand, yet comprehensive model of the core principles of trust – on a personal, company, and global level. A simple methodology to evaluate and measure the level of trust between Clients, FAs, and the company. 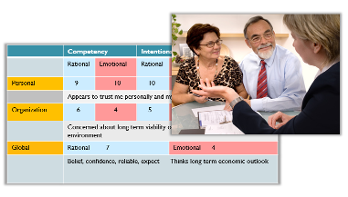 Innovative trust-based approaches to acquiring new Clients – including high net-worth individuals. The Power and Profitability of Trust was one of highest rated and most valued programs at the Compnay where it was presented. The Power and Profitability of Trust has been updated and revised to address new developments in the present market environment. Stuart Diamond, the author of The Power and Profitability of Trust, has a broad-based career. As a successful entrepreneur, he has backgrounds in education/academia, financial services, journalism, health sciences, media and the arts. He is a Woodrow Wilson Visiting Fellow and a Trustee of the California Institute of Integral Studies.